Sometimes you want to do something slightly non-traditional for your wedding. Maybe it’s to save money or maybe it’s to make things simpler. You tell your mom/sister/best friend/mother-in-law your fabulous idea, and a grim look passes over their face, and then they shut it down. “No way,” they say, “It’ll never work. 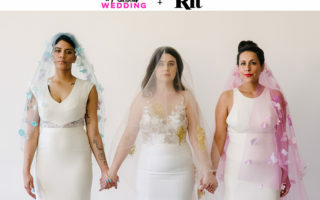 It will look terrible.” Well, this post is for those of you who want to buy grocery store cakes for your wedding cake. (Because there has to be a happy medium between buying a fancy cake and making one from scratch, right? Right?!) Bookmark this, and instead of explaining your idea to your mama, show it to her. Last week we showed you how to turn a dubiously decorated grocery store sheet cake into a hip wedding cake, because let’s be for real: not every town has fancy gourmet grocery stores (we then endured enjoyed the great cake controversy of 2013). But should you find yourself in the land of the fancy grocery stores, know that they are the untapped magic land of affordable cake. We got our cakes at Whole Foods (who will decorate cakes for you with just forty-eight hours notice and have quite the menu). For this tutorial, we assumed that you had to work with what was in the cake display. I picked (in photographic order) a Tiramisu cake, a Chantilly cake, and a Strawberry cake, because the sides of each one had an interesting texture or pattern that helped take a little pressure off when it came to decorating. In retrospect I would have picked all Chantilly cakes because PUT IT IN MY MOUTH SO GOOD DEAR GOD. Whole Foods claims that each of these cakes serves ten to twelve people, but I want to clarify that would be ten to twelve people with enormous stomach aches, because these three layer cakes are huge. No one on set managed to eat more than a very thin slice, and we all love to eat. I’d say these three cakes would pretty easily feed sixty, and that Whole Foods is out of their minds. If you want a cake to look fancy, put it on a cake stand. If you want three different cakes to look fancy, put them on matching (or coordinating) cake stands. 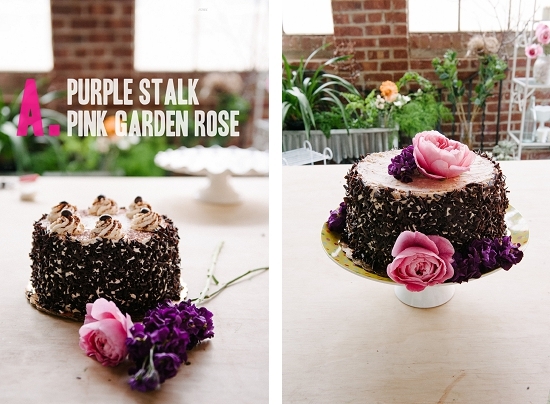 If you put flowers on a cake it looks all wedding-y. Then serve and eat. Your mama won’t know what hit her.